ACT Policing’s Homicide Team are continuing to establish the movements of a male suspect on the night murdered Evatt man Andrew Carville went missing. Mr Carville was last seen at his residence in Evatt at 9.30pm on 4 November 2015 and his body was located in Majura on 19 November 2015. Detective Senior Constable Jarryd Dunbar of the Homicide Team said several witnesses had come forward reporting a man walking along Sutton Road, Majura and Norton Road, Wamboin on the night of, and morning after, Mr Carville’s disappearance. The man sighted was described as being between 180 and 186cm tall (5’11’’ to 6’1”), of a solid build, with an olive complexion, short black hair, dark eyebrows, dark coloured eyes and wearing a black polo t-shirt, black coloured pants and dark coloured shoes. 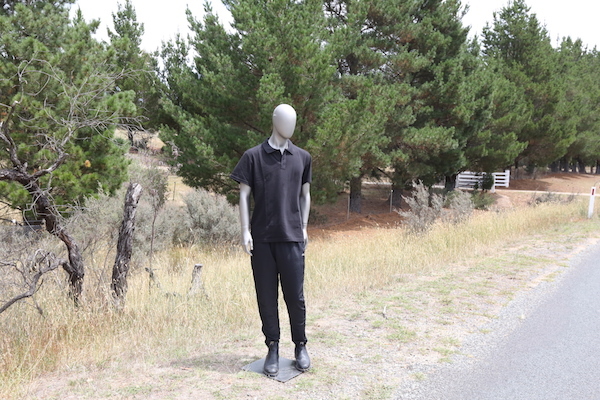 Police have issued the above photograph of a mannequin dressed in accordance with the witness descriptions in the hope that it will encourage other witnesses to come forward. “We are asking anyone who may have seen a man fitting this description walking north along Sutton Road, Majura and east along Norton Road, Wamboin between the hours of 10.30pm on 4 November 2015 and 7.25am on 5 November 2015 to make contact with us,” Detective Senior Constable Dunbar said. Contact Crime Stoppers on 1800 333 000, or via act.crimestoppers.com.au. Please quote reference number 5878272.